Wing span: 2 1/2 - 3 inches (6.2 - 7.2 cm). Identification: Abdomen is all black, or black with a yellow dash on the side of the rear. Wings are mostly black with pale yellow markings. Tails are very short on most subspecies. Life history: Males watch from rocky areas below tops of hills or mesas for receptive females. Females lay eggs singly on top of host plant leaves or on flowers. Caterpillars feed on the edges of leaves and hide at the base of plants. Chrysalids hibernate. Flight: One flight, with occasional late-flying individuals of desert populations, March-August. Caterpillar hosts: Aromatic herbs of the parsley family (Apiaceae) growing among rocks. Habitat: Mountains, desert mountains, and canyons. Range: Southern California, Nevada, Arizona, New Mexico north to South Dakota, west to Washington. Conservation: Several subspecies occur entirely or primarily on Federal lands. These include kaibabensis (Grand Canyon National Park), minori (Colorado National Monument and B.L.M. ), panamintensis (Death Valley National Monument), and martini (Mojave Desert National Preserve). 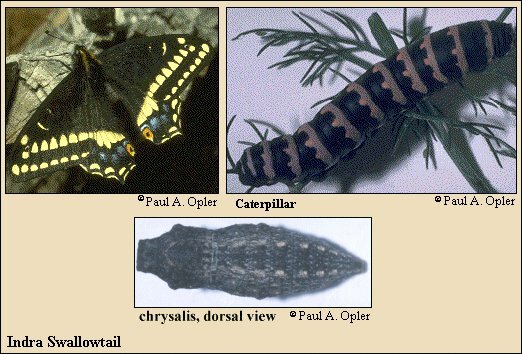 Management needs: Prevent removal of caterpillar host plants from public lands. Limit collection by permits.